I’ve been accused of being unfair to Tesla, that I am infected by personal animosity toward Musk (true; I loathe rent seekers) and a general dislike of electric cars (not true; I merely dislike the way subsidies have distorted the market for them). Well, here’s some owner testimony for you. This guy bought a new Model S – an $80,000 car. He was champing at the bit to get the keys. He most definitely did not have any ax to grind. 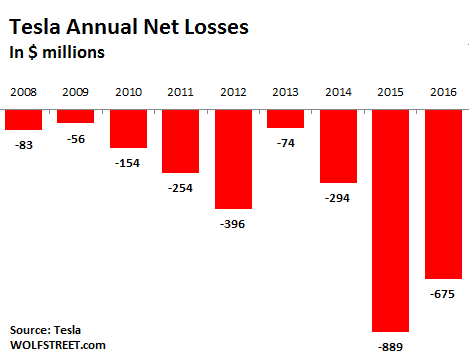 This does not bode well for Elon – whose company this week had to ‘fess up to a hemorrhagic cash bleed – $671 million, the worst yet. Wait. It is going to get even worse. Many of the “issues” detailed by the unhappy owner in the video – swirls in the paint, poor panel fitment, squeaks and rattles – may not seem major to the casual reader. And wouldn’t be . . . if it were 1978. In those days, it was actually common for even luxury-brand cars to have swirls in the paint, poor panel fitment, squeaks and rattles. The general quality control was terrible and people had much lower expectations. Cars routinely fell apart – or began to – within sight of the dealer’s lot. And within five years of leaving the lot, almost all of them were looking hairy and feeling worse. The problem for Tesla is it’s 2018. Such things are no longer tolerated . . . by people who buy $15,000 Hyundais. Or even by Teslians, for that matter – who are, after all, affluent people. People with money don’t like feeling gypped – and won’t put up with it, even when they desperately want the car to be everything it was advertised to be.